Get festive with this homemade Mexican chicken quesadilla recipe! 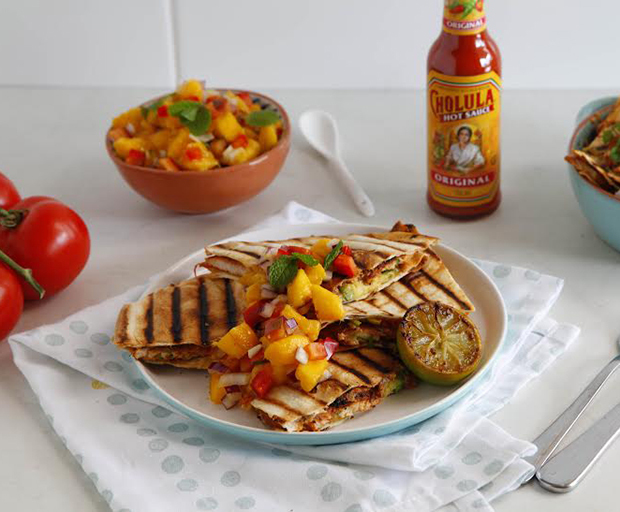 Made from the freshest of ingredients and brought together with the flavours and subtle heat of the Cholula hot sauce, this dish is a tasty addition to any dinner party. 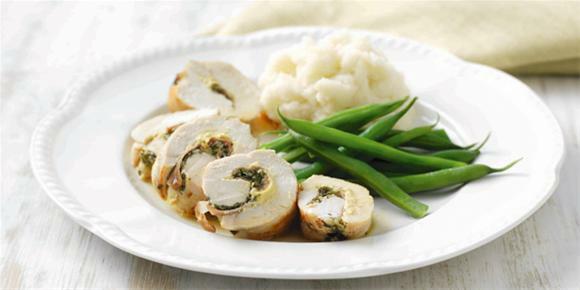 Finely slice the chicken breasts into ½ cm thick slices. Into a bowl add the Cholula Original Hot Sauce, tomato paste, lime juice, garlic, fresh coriander, salt and pepper and cumin. Gently mix the marinade together to combine and then add the sliced chicken. Coat the chicken completely in the marinade. Place the bowl into the fridge to marinate for about an hour. Meanwhile in a small salad bowl add the cubed mango flesh, red onion, capsicum, mint and olive oil. Gently mix together to combine. Place into the fridge until ready to serve. Place a fry pan over a medium heat and add a tablespoon of olive oil to heat in the pan. Place the lime halves into the pan and cook until charred and caramelised. Remove and set aside to cool. Add another tablespoon of olive oil to the pan and add half of the marinated chicken pieces. Cook for 3-4 minutes until brown and slightly crispy and turn to cook the other side for a further 2-3 minutes. Transfer the cooked chicken to a bowl and cook the remaining chicken pieces. Heat a toasted sandwich maker or press. On one of the tortillas spread a tablespoon of avocado and sour cream, a few pieces of tomato, chicken slices, and a sprinkle of grated cheese. Place another tortilla on top and carefully transfer to the sandwich maker and press the lid down. Cook for 2-3 minutes until the tortilla is golden brown and the cheese is starting to melt out from the sides. Alternatively you can cook the quesadillas in a non-stick fry pan, flipping the tortilla to brown each side. Remove the quesadillas and place onto a cutting board. Cut into in half and then in quarters. Serve immediately with the Charred Lime halves and Mango Salsa. 1. Preheat oven to 180C or 160C fan. Place chicken breast fillets, opened butterfly-style, skinned-side down on a board. Place a sheet of plastic wrap over each fillet and bat out gently, as thinly as possible without breaking flesh, using a rolling pin or meat bat. 2. In a small bowl mix garlic, sage and parsley. Smear mustard on inside of fillet. Top each with prosciutto, and spoon garlic mixture over. Starting with a long edge, roll each fillet as tightly as possible and tie neatly with string in several places. 3. In a flameproof baking dish melt butter on medium. Add chicken rolls and cook for 3-4 minutes, until browned all over. Pour over chicken stock and bake for 10 minutes, until juices run clear when pierced with a skewer. 4. Remove from oven, cover with foil and set aside for 5 minutes to rest. Remove string. Slice each roll into 2 cm thick slices and arrange on heated dinner plates, spooning cooking juices over. Serve with mashed potatoes and green beans. What’s your favourite easy dinner party recipe? Darren Simpson’s spring chicken stuffed with mascarpone, oregano, lemon zest and garlic is served with grilled asparagus and makes the perfect afterwork dinner or lazy weekend lunch. Mix the mascarpone, lemon zest, oregano and chopped garlic together and season with salt and freshly ground black pepper. Stuff this mix under the skin of the chicken. Season the chicken with a little olive oil, salt and pepper. Place skin side down on to a hot BBQ and grill for 4 minutes each side. Meanwhile brush the asparagus with a little olive oil and season with salt and pepper and place on the stove for 2 to 3 minutes until cooked, but still retaining a little crunch. 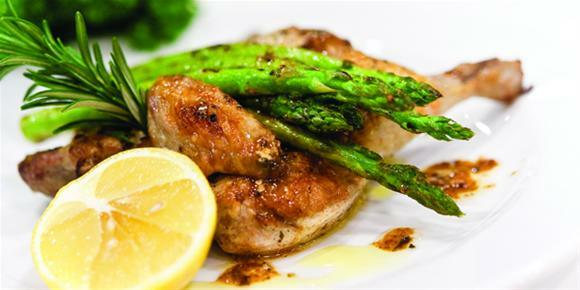 Serve the chicken with the asparagus over the top and ½ a lemon. The mascarpone melts to for a wonderful sauce.